Huawei Y9 2019 Tips & Tricks & Hidden Features - Hi Guys, is Article me Huawei Y9 2019 Tips & Tricks or Hidden Features btaunga, Huawei Y9 2019 me kafi New & Hidden Features hain jo is Tips & Tricks me cover kiye hain. Yeh 20+ kuch Hidden Faetures hain Huawei Y9 2019 me but kuch Features log jante honge lekin kuch log ye bhi nahi jante hain, My be Possible 20+ me kuch Tips & Tricks & Hidden Features koi nahi janta hoga. Mobile Phones ki Tips & Tricks me kuch Hidden Features btaye jate hain, Huawei Y9 2019 Tips & Tricks & Hidden Features me bhi kuch he Hidden Features hain or saath kuch common Features bhi hain. Huawei Y9 2019 me Wallpaper shortcut way me change karne ke liye Main Screen par touch karke hold kare to Screen ke bottom par 4 options appear hote hain, 1st option Wallpaper ke liye hai. Wallpaper set karne ke liye 2 options mil jate hain, 1st Wallpaper ko blur karke apply kare, 2nd Wallpaper ko Scrollable rakh sakte hain, Huawei Y9 2019 me kafi new Wallpapers milte hain. Huawei Y9 2019 me Home Screen par Widgets add karne ke liye or Transactions set karne ke liye Home Screen par Touch & Hold kare, Screen ke bottom par Widgets & Transactions ke option appear honge wahan se Easily Widgets & Transactions set kar sakte hain. Home Screen par Touch & Hold karne se settings ka option milta hai, Settings se Home Screen ka layout change kar sakte hain, Home Screen ke Apps lock kar sakte hain jis se Home Screen ke Apps ko koi move nahi kar sakta. Home Screen Settings me 'Auto-Align' ka option milta hai, 'Shake' ke option se align kar sakte hain Apps ko, 'Badge App Icons' se App me koi Notification ayegi to App icon par show hogi, 'Search Result' ke option se koi App ko Search Results se remove kar sakte hain. Huawei Y9 2019 me Call Voice Recorder bhi milta hai, Call karne ke bad Screen par Voice Recording ka option milta hai jis se Call Voice Record kar sakte hain. Huawei Y9 2019 ki Gallery se koi image by mistake delete ho jati hai to Gallery me he option milta hai 'Recently Deleted Pictures' wahan se Deleted Images ko dekh sakte hain or Restore bhi kar sakte hain. Huawei Y9 2019 me Screenshot lene ka similar method hai other Smartphones ki tarah, Volume Down + Power Button And Screenshot lene ke bad Directly Edit bhi kar sakte hain or Share bhi kar sakte hain. Huawei Y9 2019 ke Notification Bar me jo option show hote hain wo edit karne ke liye Top par Pencil like icon milta hai, is option se Notification Bar ke options ko select kar sakte hain jo options Notification Bar me rakhne hain. Huawei Y9 2019 ke Notification Bar me Screen Recorder ka option bhi milta hai means agar aapko Screen Recording karni hai to koi Third Party Application download karne ki zarurat nahi hai. Huawei Y9 2019 ke Camera me kafi Feature milte hain, Tap to Cature, Capture Smiles, Object Tracking Or Volume Button ko image Capture or Zoom ke liye use kar sakte hain. Camera me Ultra SnapShot ka option milta hai jo Fastly picture capture karta hai means mobile phone ko unlock karne se pehle picture capture karni hai to simple Volume down button ko 2 times press karne se picture capture ho jayegi. Huawei Y9 2019 ki settings me Storage Backup ke liye option mil jata hai jis se Phone ka storage backup rakh sakte hain or agar Accidentally Storage clear ho jaye to Restore kar sakte hain. Battery ke option se Battery Percentage ko enable kar sakte hain jis se Screen ke Top par Battery Percentage show hogi or Screen Resolution ka option milta hai jis me by default Smart Resolution hota hai usko HD+ Or FHD+ kar sakte hain. Display me Auto Brightness or Temperature ka option milta hai or saath he Eye Comfort bhi hai jo Eye Protection ke liye hai, Eye Comfort ko directly Enable bhi kar sakte hain or schedule bhi rakh sakte hain. Settings me Wallpape auto Change ka option milta hai jis se Timing set kar sakte hain or us Time se Wallpaper change honge, For Example 5 Minutes rakhte hain to Every 5 minutes Wallpaper change ho jayega. Huawei Y9 2019 ki Screen me Top par beautiful Notch hai but if you don't like Notch, Notch disable karne ke liye Settings me option milta hai. Huawei Y9 2019 ki settings me View Mode or Text Size ke options milte hain jis se Text Size ko control kar sakte hain Text Size ko Large Small or medium kar sakte hain. Huawei Y9 2019 me different Text Style milte hain, Settings me Text Style ke option se Text ke Style ko change kar sakte hain. Huawei Y9 2019 me apko Face ID or Fingerprint scanner milte hain, Security se Face ID or Fingerprint Scanner ko set kar sakte hain, And Fingerprint Scanner ko Call Receive ke liye use kar sakte hain. Or Fingerprint scanner se Photose/videos capture or open/close kar sakte hain, Also Notification Bar ko bhi Fingerprint Scanner se use kar sakte hain. Huawei Y9 2019 me apko Face ID or Fingerprint scanner milte hain, Security se Face ID or Fingerprint Scanner ko set kar sakte hain, And Face Unlock me Direct Unlock or Slide to Unlock ka option milta hai. Huawei Y9 2019 me by default App Lock milta hai matlab koi Third Party App Lock Download karne ki zarurat nahi hai, Or Apps Unlock ke liye Fingerprint Scanner or Face Unlock ko use kar sakte hain. Huawei Y9 2019 large Screen wala mobile phone hai that's why One Hand use karne ke liye kuch Features hain, Shifting keyboard ko Settings se enable kar sakte hain or One Hand UI ka Feature bhi Settings me milta hai. For 3 Fingers Screenshot: Touch 3 Fingers on your screen & Swipe down. Huawei Y9 2019 me schedule Power On/Off karne ka option bhi milta hai, ye option ziyada use nahi hota hai but at least hota hai ye devices me or agar aap use karte hain to definitely use kar sakte hain. Huawei Y9 2019 ke Assistant Navigation me 3 styles milte hain, Settings me ye option milta hai wahan se Easily Navigation set kar sakte hain or Huawei Y9 2019 ke Assistant Navigation me iPhone ki tarah Dot option bhi milta hai. 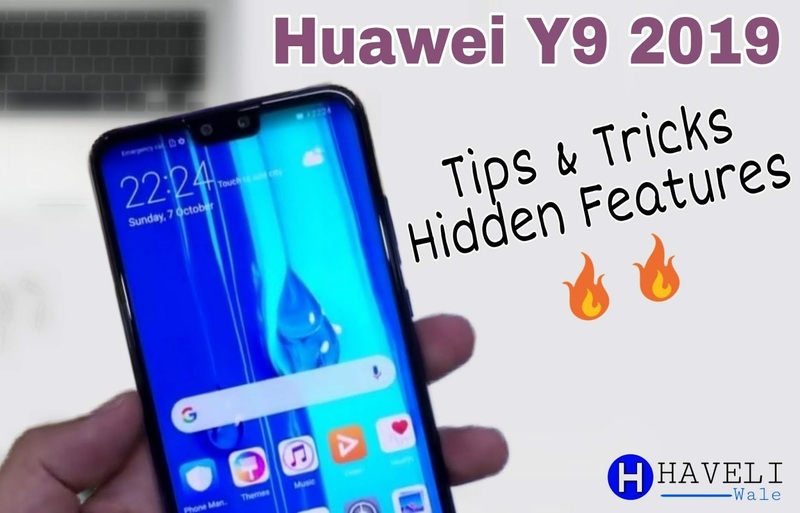 Yeh 23 kuch Hidden Faetures the Huawei Y9 2019 me but kuch Features log jante honge lekin kuch log ye bhi nahi jante hain, Hopefully apko Huawei Y9 2019 Tips & Tricks & Hidden Feature pasand aye honge or apko Huawei Y9 2019 device ke kuch New Tips & Tricks & Hidden Feature mil jayenge.